Now an apple on the way, keeps the flights away! Recently an Apple iPad app used by pilots has caused delays for American Airlines with about 24 flights which are affected due to the glitch that is forcing aircraft to return back to the gate. Casley Norton, an American Airlines spokesperson, confirmed that pilots have been experiencing issues with the iPad app which holds critical maps and information of flight plan. There are certain cases where pilots were able to resolve the issue, but they still imposed a force on others to move back the aircrafts to the gate. 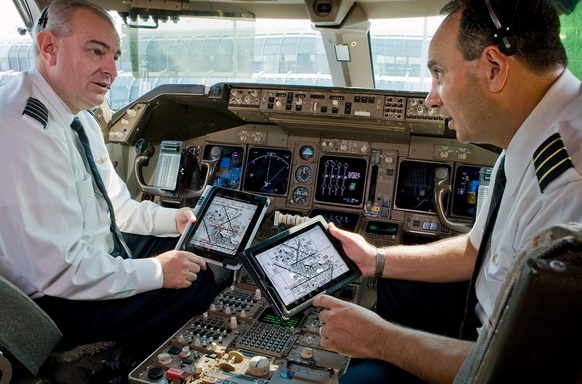 It can be better said as there were some flights experiencing an issue with a software application on pilot iPads. According to the airline, the reason is still unknown, why the glitch occurred. The issue is not a mere system-wide problem that is affecting a specific type of aircraft, but at the same time, reports on the social media on the contrary. The customers got very angry as the Twitter says. In its response, the American Airlines said that it is working on the issue and definitely going the extra mile in every possible way to find a solution for the problem.